Choose from more than 1,200 slot and video poker machines, including some of the most popular games ever created. 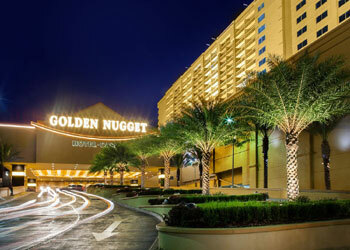 The Buffet at Golden Nugget Biloxi - Enjoy our newly remodeled buffet all-you-can-eat breakfast, lunch and seafood dinner. Featuring all your favorite coastal cuisine, as well as new Carving, Saute and Italian stations surrounded by an all new, modern design. Check out our deluxe Salad and Dessert Bars too. Morton's The Steakhouse - Morton's The Steakhouse features a sleek design incorporating a modern take on the traditional steakhouse look -poised to be the ultimate fine dining experience in Biloxi. Lillie's Noodles, Asian Cuisine and Sushi - Offering traditional, modern Asian cuisine in a chic, contemporary ambiance. Lillie's Noodles Asian Cuisine and Sushi embraces exotic flavors in an elegant surrounding. Michael Patrick's Sports Cafe and Grille - Your place to catch all the sports action - playing continuous sports and video poker action 24 hours a day! Starbucks Coffee Shop - Enjoy delicious espresso beverages, Tazo Tea products and various Frappuccino blended beverages at Starbucks, located on the first floor of the casino. Bubba Gump Shrimp Co. - Bubba Gump Shrimp Co. captures the charm and American spirit that made "Forrest Gump" a smash hit. Shrimp is the specialty at Bubba Gump Shrimp Co., but in our fun, casual indoor and outdoor setting there is definitely something for everyone. From award-winning ribs to out of this world seafood dishes and of course, remarkable desserts, you're sure to go home happy.